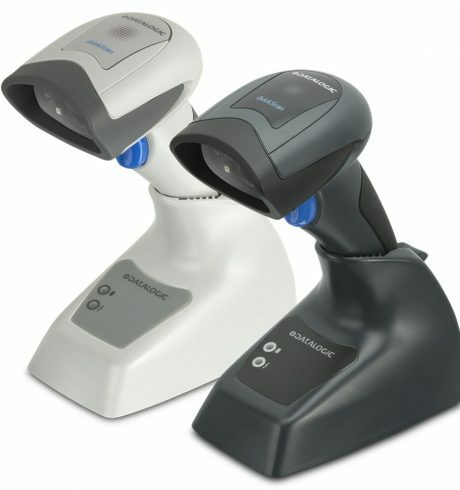 Simply capture barcodes mobilely – a matter of course with Datalogic’s QuickScan QBT2400. The cordless area imager features modern Bluetooth wireless technology, and transfers the collected data quickly and reliably. It scores well with its excellent price-performance ratio and aggressive reading performance. Thus, the QuickScan provides a high pace in the capture of printed and digital 1D and 2D barcodes. The large Bluetooth wireless range of up to 25 m around the base station increases user efficiency. No cables disturb at work, and the movements are natural and intuitive. The freedom of movement has a positive effect both on the ergonomics and user performance. The QBT2400 sends the data either via the base station to the host or any Bluetooth device within range. Use the QuickScan QBT2400 easily with almost any tablet or mobile computer – via Bluetooth HID profile easily connect devices based either on Android or iOS. The strong performance of the lithium ion battery ensures for long operating times. The battery – the most in demand part in everyday life – can be easily replaced on-site by the user. This saves time and maximizes efficiency. If a defect occurs, only the affected part must be replaced, which positively reflects in operating costs. The integrated scanner stand features a micro USB port, as an alternative charging method, so that only cradle recharging is not necessary. Datalogic’s patented Green Spot good scan confirmation ensures that the user receives clear feedback after every scan. The characteristic green good read dot lights up on the captured barcode after a successful scan. System errors and loss of time due to double scanning become a thing of the past. The targeting and lighting systems of the QuickScan QBT2400 are also user friendly and efficiency-oriented. The dark red lighting goes easy on users’ eyes. Two starkly contrasting blue triangles clearly define the target area, making working with lists more precise.